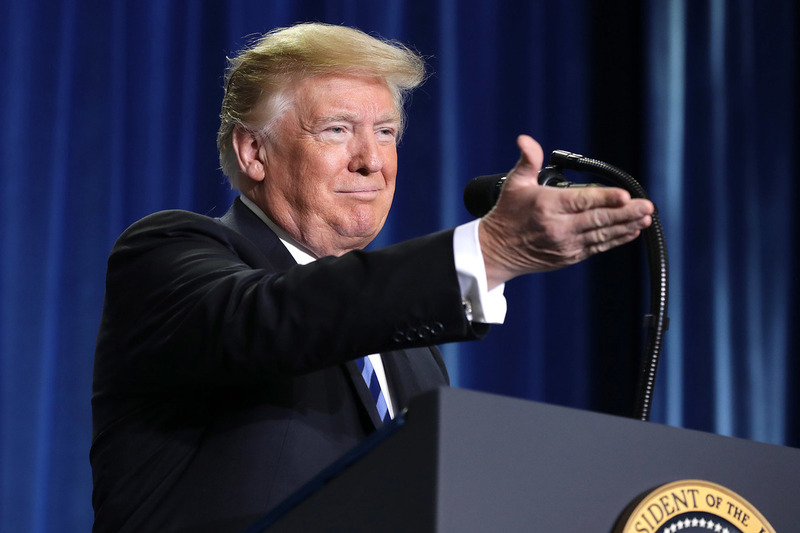 Trump Says Medicare Part B Should Pay Less For Drugs : Shots - Health News An administration proposal would link what Medicare pays for certain drugs administered in hospitals and doctor's offices to the prices paid in Europe and other advanced economies. President Trump announces a plan to overhaul how Medicare pays for certain drugs during a Thursday speech at the Department of Health and Human Services in Washington, D.C. The proposed changes are related to the Medicare Part B program that pays for medications that patients receive in hospitals or in doctor's offices. Today, Medicare reimburses doctors and hospitals the average sales prices of the drugs, plus 6 percent to cover the cost of giving medications to patients. The arrangement gives physicians an incentive to prescribe the most expensive medications, because they will collect a higher fee, Trump said. The new formula, if approved, would be phased in over five years. U.S. residents pay more than patients an all other high-income countries for medications, according to a 2017 study by the Commonwealth Fund. HHS today released a study of 27 drugs that are usually paid for by Medicare Part B that showed that on average the U.S. pays 80 percent more than the average prices in other countries. HHS Secretary Alex Azar said on Twitter that some of the drugs cost four times as much in the United States. The HHS study, for example, shows that the U.S. spent about $1.7 billion in 2016 on Rituxan, a drug made by Biogen Inc. that treats non-Hodgkin's lymphoma. If the drug were priced using the formula the agency wants to use in the future, spending that year would have been about $1 billion less. Azar Tweeted that Medicare spends $8.1 billion more a year than if U.S. prices were in line with prices elsewhere. The agency is also proposing creating a new group of middlemen to negotiate bulk purchase prices for this class of drugs, bill Medicare and then distribute the medications to doctors. "If they can bring down the prices, that's a positive thing," says Ted Okon, executive director of the Community Oncology Alliance, which represents independent cancer doctors. "How are they going to do it? Is it going to work? Is it legal? Those are the questions." Okon says he worries about inserting middlemen between oncologists and their patients. He says his organization's research shows that pharmacy middlemen increase medical errors and can be dangerous to patients. In addition to trying to cut the base price of the drugs, the administration, through HHS, is proposing changing how doctors who deliver these drugs are paid. The agency will launch a pilot program to reimburse doctors with a flat rate, rather than a percentage of the drug's price, to remove any incentive for doctors and hospitals to choose more expensive drugs over cheaper ones. Okon says there is no evidence that doctors prescribe high-priced drugs because they make more money. An analysis of published studies on financial incentives under Medicare found otherwise. "The mark-up on Part B drugs appears to independently influence prescribing patterns," said a May policy paper from Memorial Sloan Kettering Cancer Center's Drug Pricing Lab. In the case of cancer treatments, the analysis found that "oncologists shift prescribing towards drugs with larger absolute mark-ups." Dr. Kavita Patel, an internist at Johns Hopkins Hospital and senior fellow at the Brookings Institution, says the proposals could make a difference. "If the goal is overall out of pocket cost reduction for consumers, these proposals are promising and offer some of the boldest challenges to the medical establishment," said Patel, who worked on health policy in the Obama administration. "It is interesting that aspects of this mirror an Obama administration proposal which faced so much opposition and was ultimately never implemented," she said. Obama proposed changing the percentage-based payment system for Part B drugs but was met with fierce opposition from oncologists and rheumatologists. The agency received more than 1,350 public comments opposing the change, many from doctors who said they would have to close their practices if the plan went forward, and from patients who in turn said they feared they would lose their doctors. The pharmaceutical industry, which also opposed the plan, spent almost $250 million on lobbying in 2016, though that was not limited to lobbying on this issue. Eventually even Democrats in the House and Senate, who heard opposition from constituents, came out against the plan. Obama dropped the proposal a month before he left office. But PhRMA, the drug industry's main trade group, came out strongly against Thursday's proposal. "The administration is imposing foreign price controls from countries with socialized health care systems that deny their citizens access and discourage innovation," said a statement from PhRMA CEO Stephen Ubl. HHS says, after opening the proposal for public comments, it hopes to issue a final rule by the spring of 2019 and start the new payment system in 2020.